WonderCon 2019 was a huge success for Legion M! Our booth with Stargate had crowds all weekend, our panel had the biggest turnout yet, we hosted several autograph signings, and we held not one but two great Field Guide to Evil meetups! Overall, we added nearly 300 new members to the Legion and forged new fellowships that will last a lifetime. Our panel was at 2:45pm on Friday, just before the Tolkien panel in the Arena. The crowd was the biggest we’ve ever had for a Legion M panel! Terri Lubaroff, Jeff Annison, and David Baxter introduced the Legion and many of its past, current, and future projects to a crowd of nearly three hundred. Some highlights include an audible gasp from the crowd when we mentioned that two of our investors got to be in a scene of the new Jay and Silent Bob Reboot on their set visit, applause for “Evermor” showrunner Andrew Cosby (Hellboy), and updates on our various projects in development. We also heard from Tanya Wexler about Legion M’s new franchise property, “Girl With No Name.” Beginning as a comic book to build the franchise for a feature film, “Girl With No Name” tells the story of a young female gunslinger on her quest for vengeance in the Old West. Tanya shared the history of the franchise and the importance of the story in the western genre. Pre-sales for the comic book are available on Kickstarter now! On Friday morning, Tula Lotay, the cover artist for Legion M’s first comic book “Girl With No Name” stopped by the booth to sign autographs. Several excited fans picked theirs up in person, and the rest we tucked away for future giveaways and perks! If you haven’t pre-ordered your copy of the comic book yet, you can do so here on Kickstarter. Friday evening, we were happy to host a multitude of famous voice actors at our booth for autograph signings, including E.G. Daily (“Rugrats”), David Sobolov (“The Flash”, Guardians of the Galaxy), Debi Derryberry (“Jimmy Neutron”), Julie Nathanson (Suicide Squad: Hell to Pay), Daniel Ross (Donald Duck) and more! On Saturday, the director of Tolkien himself, Dome Karukoski, drew quite a crowd at the Legion M booth. He signed posters and prints for forty-five minutes until he had to head to the early screening of Tolkien in Orange. We were forced to cap the line (and even had to turn a few folks away!) to get him out on time. Don’t worry—we snagged a few extras for Legion M as well! On Sunday, we were honored to have Tom Akel, writer of POW! Entertainment’s comic “Back Channel” (co-created by Stan Lee), stop by the booth for an autograph signing. Writer of “Back Channel,” co-created by Stan-Lee. As good fortune would have it, The Field Guide to Evil, one of Legion M’s earliest film investments, hit theatres the same weekend as WonderCon. Even luckier, the only theatre playing the film in Southern California happened to be in Santa Ana, just a few miles away from the Anaheim Convention Center. 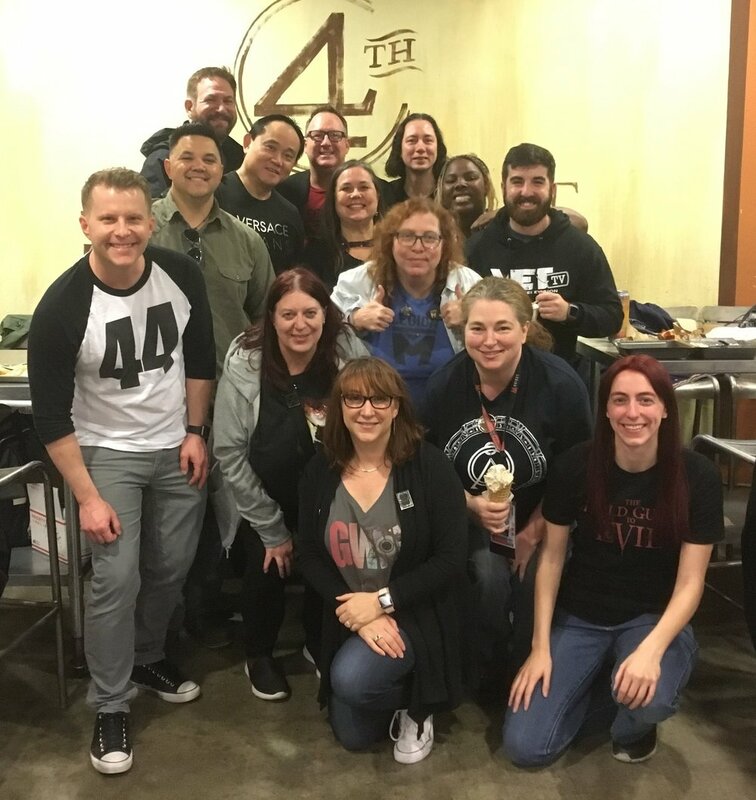 Legion M hosted two meetups for the film, one on Friday night and one on Saturday night, at the 4th Street Market and Frida Cinema. The turnout was incredible, and everyone had such a great time chatting about and dissecting each segment of the film after the movie showing – even though it was well after midnight! Jeff, Terri and David kept a very busy schedule of interviews with the press attending WonderCon. The executives spoke to more than a dozen press outlets, bloggers and podcasters, sharing details about the Legion and our projects. Coverage is still rolling in, but here are a few highlights leading up to and during WonderCon weekend! Legion M Gives Fans A Voice In Hollywood!